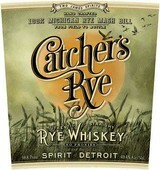 Distilled from 100% Michigan rye and pure water from the Great Lakes, Catcher's Rye is a testament to the grain's distinctive terroir. Each drop is artfully produced and aged for a minimum of two years in traditional, charred new American oak 53 gallon barrels. With delicious spice notes and a subtle fig finish, Catcher's Rye proves there is no substitute for time or proportion. This is a labor of love, accept no phonies.